One of the things that set the Disney Store's Incredibles line so far above Hasbro's was the fact that they weren't afraid to include the girls: you could buy Helen and Violet at the Disney Store, but Hasbro never even bothered to make them. Or at least not mass-market versions of them. Two of the main characters, and if you only shopped at Wal*Mart, then they didn't exist? That's idiotic! And even worse, Hasbro is doing it again, with their laughable line of figures based on The Lion, the Witch and the Wardrobe - both the boys, neither of the girls. Susan is the second-oldest of the Pevensie children, and certainly the most mature. She acts as a mother figure, trying to watch over her younger siblings both in the real world and in Narnia, but with this attitude comes a skepticism that may doom her. Remember that C.S. Lewis and J.R.R. Tolkien were compatriots, so it's no surprise that women fare as badly in Narnia as they did in Middle Earth. At least Tolkien just ignored them: Lewis seems to have found them quite evil. Girls are fine, grandmothers are fine, women are evil. Susan is possibly the ultimate victim of Lewis' quaint, Victorian-tinged sexism, which is only quaint in the same way as Victorian racism. 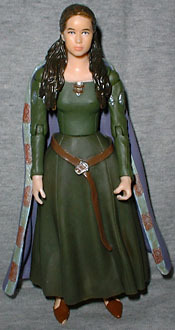 Susan is wearing the green dress she received once the kids had reached Aslan's camp. The dress isn't very detailed, but that's because it wasn't in the film, either - no crazy patterns or anything. There are diamond cutouts on her upper arms and ties at her wrists. The dress ties up the back, and she's got a belt cinched around her waist. There's a bit of a pattern on the red and silver edges of her lavender cape, and her small brown sandals wrap up around her ankles. The likeness isn't perfect, but it is very good. Hasbro's formless lumps of plastic can only be identified by their costumes, but this figure really looks like Anna Popplewell. Susan's hair is really sculpted well, with a braid running back from her temples and her hair spilling down over her shoulders below that. Everyone who complained about the "blushing" Incredibles figures will be happy to know that isn't at all evident here. Articulation is excellent. Susan moves at the ankles, shins, knees, hips, waist, shoulders, biceps, elbows and wrists. The hips and shoulders are balljoints, and her waist is loose enough that it functions like one - you can raise her torso up off her legs just a bit, and then she can tip forward and back, side-to-side. Her head is on a balljoint, but it's rendered useless by the fact that her hair plugs into the back of her neck. No idea who thought up that one. Susan comes with the gifts she got from Father Christmas: an archery set and, because C.S. Lewis says girls can't be self-sufficient, a horn to call for help. The detailing on the accessories is very intricate. The horn is sculpted to look like the head of a lion, there's a floral pattern on the quiver and the bow, and the arrowheads look like leaves. The arrows can be removed from the quiver and the bow has a real string, but you can't truly fire anything. Though her left hand is molded to hold either the bow or the horn, Susan still can't use all her gear at once: the quiver doesn't attach in any way, the horn doesn't have a strap, etc. You'll just end up with a pile of stuff around her feet. The packaging on these figures is really quite good - it was even nominated for a 2005 ToY Award. The Disney Store seems to love its complicated clamshells, and this line is no different. The entire package is shaped vaguely like the titular bit of furniture, with an insert showing the front of the wardrobe, its door open to reveal the land within. With the figure in a tray in front of the insert, you really get the impression that they're coming through the wardrobe. The different sized chracters come in different sized clamshells, so Lucy's package is decidedly smaller than Aslan's. The insert is printed on a slightly heavy stock, so you might choose to hold onto it after you open the figure. The stickers on the front of the blister, with the Narnia logo and the character's name, are actually embossed, so the letters and edges are raised slightly. This is beautiful work. It's bad enough that Susan gets locked out of Narnia by C.S. Lewis, but did Hasbro have to lock her out of the toy line, as well? Oh well. 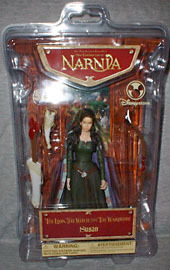 Neil Gaiman gave her her literary revenge, and the Disney Store has given her revenge in plastic. This is a great toy, definitely on par with the best things we get from mainstream companies. Who's the mystery company behind the Disney Store's great toys? Tell us on our message board, the Loafing Lounge.